Fly in to Nelson airport from almost any other city in New Zealand and start your journey to the Abel Tasman. Or travel through it from Picton if you've come across on one of the Cook Strait ferries. Nelson offers a huge variety of accommodation and activities. Stop for a while and enjoy this vibrant town. Full of cafés and restaurants sit outside and enjoy the atmosphere. Wander around the waterfront, enjoy Tahunanui Beach or visit one of the many galleries. 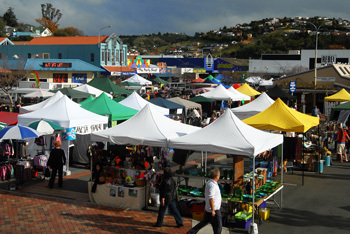 If here on a Saturday make sure you enjoy the Saturday morning arts and crafts market where many of the Nelson region's talented artists display their ware. You'll also find delicious foods on offer. There's also the World of Wearable Art Museum, the Nelson Museum and Founders Park (an exhibition of historical buildings and collections). Nelson is also the geographical centre of New Zealand, so make sure you take the lovely walk to the top. The Richmond Ranges offer great walking and mountain bike tracks. 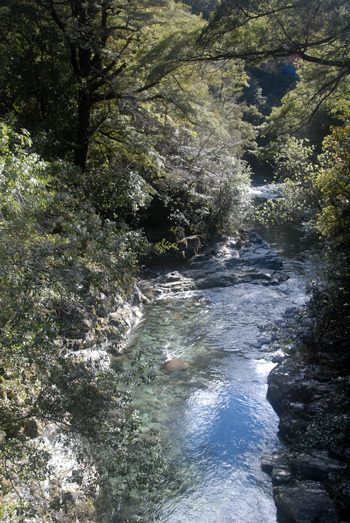 Take a picnic and enjoy one of the lovely swimming holes.